The ASUS ZenFone 3 Deluxe (ZS570KL) flagship phone finally lands in the Philippines, just in time for the holiday season. Its finally here! ASUS’ 5.7-inch flagship smartphone has finally arrived in the country. 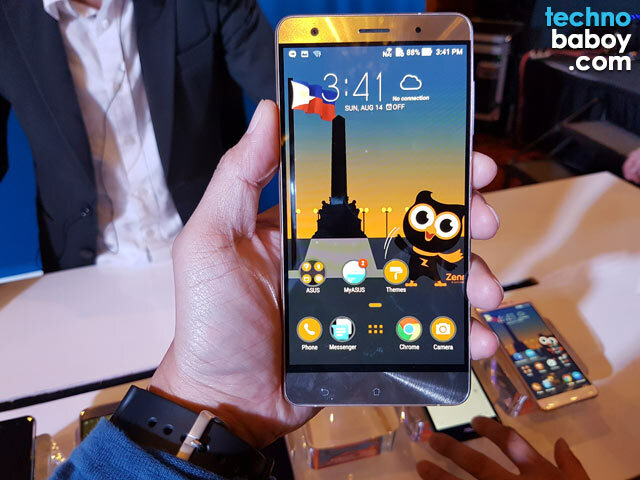 Launched last August during the Zenvolution 2016 event, incorporates a new design and outstanding specs. Featuring a slim all-metal chassis, the phone has the world’s first invisible antenna design, giving it a smooth and seamless unibody build. The ZenFone 3 Deluxe flaunts a 5.7 inch super AMOLED display, protected by Corning’s Gorilla Glass 4. According to ASUS, it has a color gamut that’s greater than 100% of the NTSC color space, allowing for more colorful and accurate colors. Inside, you’ll find a quad-core Qualcomm Snapdragon 821 processor paired with 6GB of RAM (yes, that’s 6GB!) and an Adreno 530 graphics processing unit. There are two storage options 64GB or 256GB with microSD support of up to 128GB. The 23MP PixelMaster main camera uses a Sony IMX318 sensor equipped with a slew of features such as f/2.0 aperture, OIS, EIS, laser AF and PDAF. The rest of the specs include a a rear fingerprint scanner, a USB Type-C port, a 3,000 mAh battery with Quick Charge 3.0, and Android 6.0 Marshmallow with ZenUI 3.0. ASUS Zenfone 3 Deluxe 5.7-inch variant retails for P34,995. It comes bundled with a ZenPower UItra power bank. You can also get the flagship through an installment plan of 0% interest for up to 6 or 12 months.